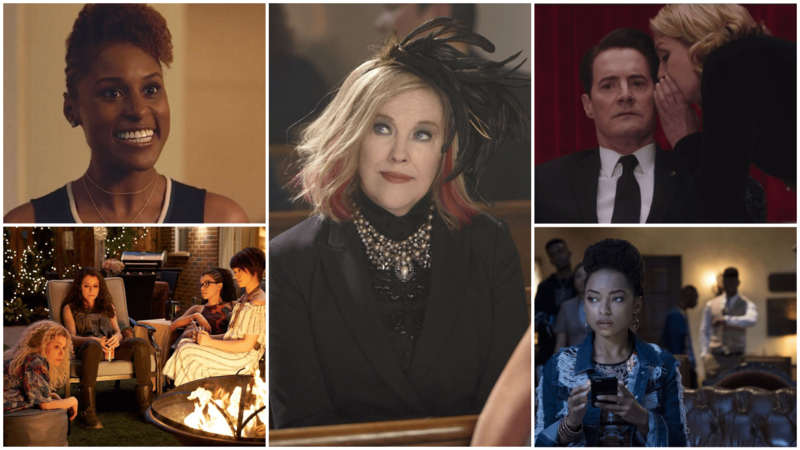 The 2018 Emmy nominations are in they were full of surprising names, shocking snubs and three on the verge of EGOT status. Here’s how yesterday’s noms broke down. Tatiana Maslany returned as a nominee in Lead Actress in a Drama Series for the first time since her win for Orphan Black, and just in time as it was the show’s final season. Netflix’s Ozark made a surprisingly impressive showing that included Jason Bateman breaking into Lead Actor in a Drama Series and most especially the two directing nominations it grabbed (including another for Bateman there). Westworld showed surprising strength in the acting categories in its second season. It took a risk by bumping up Jeffrey Wright and Ed Harris from supporting to lead where they both got in. Last year, only Wright got a nomination. Issa Rae (Insecure) and Ted Danson (The Good Place) earned Lead Actress and Actor nominations (respectively) in the second seasons of their critically raved shows. With any awards nominations there will be some major snubs. Snubs both in terms of what most people were predicting but also for those people felt most deserving of a nod. One of the big ones this morning was the reboot of Will & Grace. The Emmy-winning comedy had previously been a nominations champ and won the top prize once and earned wins for each of its main stars. This year, only Megan Mullally could even muster a nomination among the four and the show was snubbed in Comedy Series. Modern Family, which went on a record-trying five-year streak as the Comedy Series winner was finally taken down. It did not earn a series nomination for the first time in its history. Same goes for Ty Burrell, who finally drops off. The show earned just a single nomination; for sound mixing. Emilia Clarke’s move from supporting to lead for Game of Thrones didn’t pay off, she didn’t make the cut. Same goes for Kit Harington. He also graduated to lead and got snubbed. Ironically, that move finally earned Nicholaj Coster-Waldau a nomination in supporting. David Lynch might have earned three personal nominations for Twin Peaks: The Return (in directing, writing and sound) but the show itself came up zero for Limited Series, Lead Actor for Kyle MacLachlan and Supporting Actress for Laura Dern or Naomi Watts. GLOW did well in its freshman season with 10 nominations including Outstanding Comedy Series but two of its stars, Alison Brie and Marc Maron (both the heaviest predicted by pundits), were left out of the ring. Freddie Highmore starred in one of network’s big breakouts this last season, The Good Doctor. But, his nomination total remained DOA. Liev Schreiber (Ray Donovan) earned three separate nominations last year and this year found himself out of the Lead Actor in a Drama Series race for the first time in the show’s run. It seemed like Mandy Moore and Justin Hartley, left off the nomination list last year for This Is Us, were going to make it in this year. Nope. Al Pacino may seem like an Oscar favorite but the Emmys love him too, he’s a two-time winner. But, not this time. His turn in Paterno just didn’t turn heads. Once again, the brilliance of Catherine O’Hara in Schitt’s Creek went unrecognized. Same goes for Justin Simien’s bracing, and bracingly funny Dear White People. Let’s not even talk about BoJack Horseman getting snubbed in Animated Series. AGAIN. One Day at a Time‘s profile grew from season one to two, including a massive social media push for renewal (which it got) but that wasn’t enough to earn the praised multi-cultural comedy a top tier nom, not even for EGOT winner Rita Moreno. David Fincher and Charlize Theron brought the bingeworthy Mindhunter to Netflix but could only muster a single (but oh so deserved) nomination in Guest Actor in a Drama Series for Cameron Britton’s super duper creepy serial killer. Sandra Oh (Killing Eve) became the first actress of Asian decent to be nominated for Lead Actress in a Drama Series. Oh had previously been nominated five times in Supporting for Grey’s Anatomy but never won. There are three EGOTs in the making, and all because of one show. NBC’s Jesus Christ Superstar Live put John Legend, Tim Rice and Andrew Lloyd Webber all within arm’s reach of the elusive Emmy/Grammy/Oscar/Tony that only 12 people have ever accomplished. But look out for upstarts Benj Pasek and Justin Paul. They are nominated for an Emmy for their song “In the Market for a Miracle” from A Christmas Story – Live. There are 33 first-time nominees Megan Amram, Sara Bareilles, Zazie Beetz, Cameron Britton, Nikolaj Coster-Waldau, Penélope Cruz, Alexis Denisof, Brandon Victor Dixon, Joseph Fiennes, Lee Garlington, Betty Gilpin, Matthew Goode, Naomi Grossman, Tiffany Haddish, Melvin Jackson Jr., Kelly Jenrette, Diarra Kilpatrick, Vanessa Kirby, John Legend, Ricky Martin, Kelli O’Hara, Adina Porter, DeStorm Power, Issa Rae, Jimmi Simpson, Matt Smith, Yvonne Strahovski, Michael Stuhlbarg, Miles Tagtmeyer, Russi Taylor, Katt Williams, and Letitia Wright. Aidy Bryant (Supporting Actress in a Comedy Series), Darren Criss (Lead Actor in a Limited Series or Movie), and Kenan Thompson (Supporting Actor in a Comedy Series) are also all first-time performer nominees, though each received a past Emmy nomination for Original Music and Lyrics. Multiple nominees include (but are not limited to) Jason Bateman for Ozark; Alex Borstein for The Marvelous Mrs. Maisel and Family Guy; Sterling K. Brown for This Is Us and Brooklyn Nine-Nine; Jeff Daniels for The Looming Tower and Godless; Donald Glover for Atlanta and Saturday Night Live, Bill Hader for Barry and Saturday Night Live; Jane Lynch for Hollywood Game Night and The Marvelous Mrs. Maisel; Alex Berg for Barry and Silicon Valley; The Duffer Brothers for Stranger Things; Scott Frank for Godless; David Lynch for Twin Peaks: The Return; and, Amy Sherman-Palladino for The Marvelous Mrs. Maisel. Leading the nominations in totals by platform were Netflix (112), HBO (108) and NBC (78). This is the first year Netflix has topped the nomination list, which HBO has dominated for the last 17 years in a row. Game of Thrones surpasses ER as the most most nominated narrative network show of all time, with 129 over seven seasons. GOT also holds the record for most win for a fictional series with 38. Saturday Night Live is the record holder for most nominations and wins for any program with 231 and 64, respectively. Creator Lorne Michaels is the most-nominated individual with 82.